I will be covering best practices for buying and selling coins via the Internet as well as covering online auctions by houses like Heritage and GreatCollections and smaller sessions through portals like Proxibid and eBay. Online Coin Auctioneering is intended for eBayers who sell coins and for estate auctioneers considering or already selling on a portal such as AuctionZip, iCollector or Proxibid. 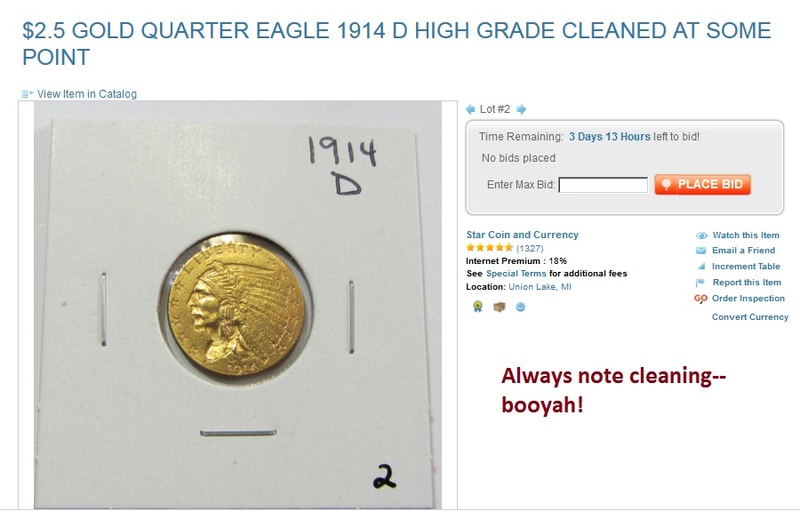 Much of the advice also pertains to online coin dealer auctions. Selling coins online is complex, but knowing the basics will get you started in a rewarding hobby or side business. Moreover, online selling is safer than vending at a local antiques mall or coin show where you can lose your entire inventory from theft or other calamity. Better still, you can sell online from the privacy of your home and enjoy the process of contributing to the world’s greatest hobby. Michael Bugeja, columnist for Coin World and reporter for Coin Update News, shares results of a comprehensive study of all U.S. Mint circulating coinage, identifying the placement and artistic effect of dates, denominations, legends, mottoes, symbols and other devices. The result is a startlingly helpful analysis of basic design questions, such as “How to Tell Heads from Tails” (difficult on some coins) or “Why the Morgan dollar is the most popular collected coin.” The book has two sections, one devoted to the study and the other a detailed discussion of basic design elements, such as the privy mark or the three-sided canvas of a coin (obverse, reverse, edge). Learn coin design from a top numismatic writer and enjoy the hobby of collecting from an entirely different and enlightened perspective. 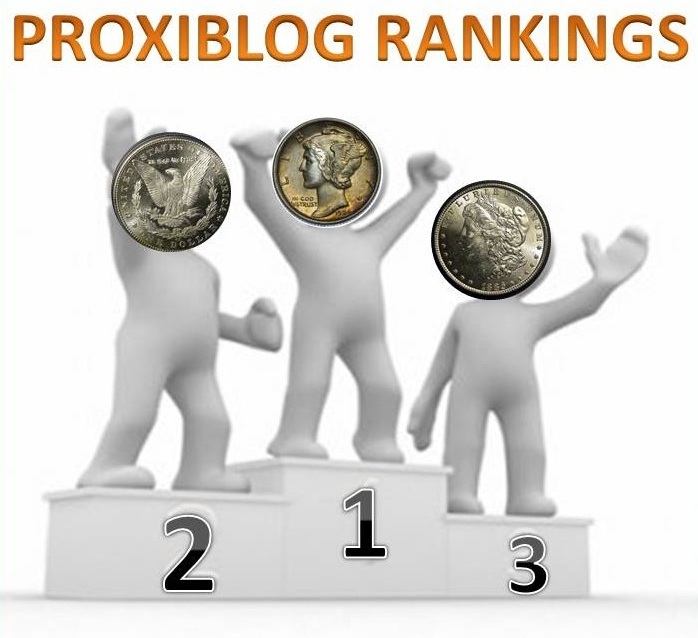 Proxiblog has been posting now for almost four years on a daily weekday basis, explaining numismatics to newcomers to the portal and advocating for best practices. It has been a labor of love with more than 750 posts and thousands of coin photos and screenshots. 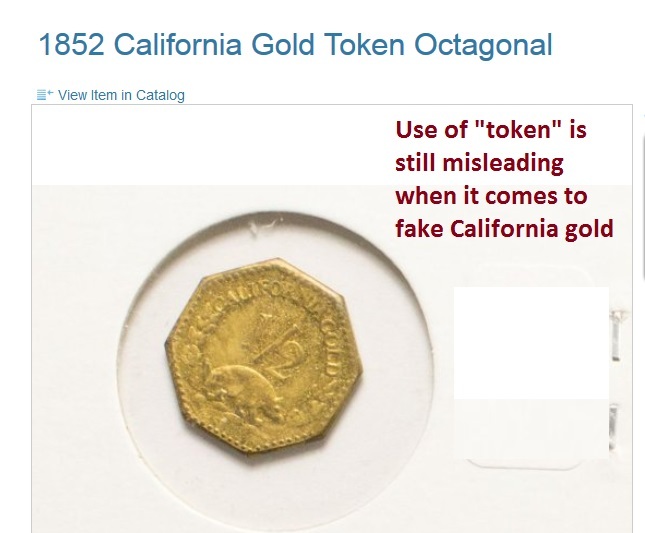 In recent months, however, we have been noticing that we are repeating the same best practices–low buyer’s premium, sharp photographs, reasonable shipping, etc.–and bemoaning the same bad practices, ranging from fake California gold to outrageous estimates of value. We think our job has been done. We also believe we made a positive impact on Proxibid. As such, we will cease daily weekday and only publish occasionally thereafter. This month our rankings list in the left sidebar represents our “All-Time Favorite Auctions,” those that have been included in our top 20 throughout much of our existence. 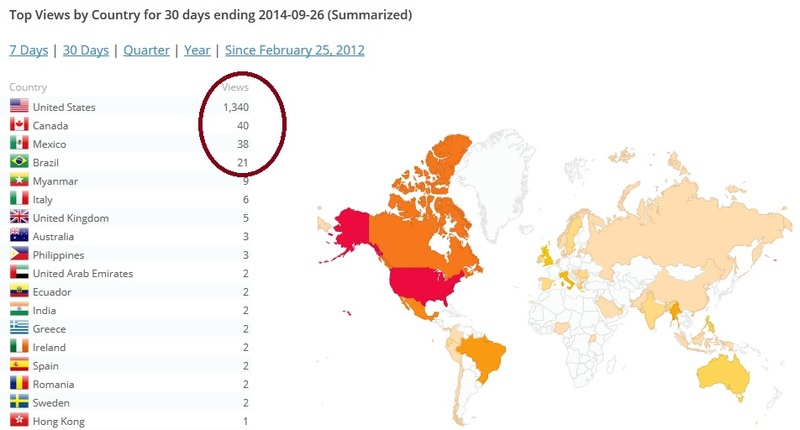 We are truly grateful for the thousands of viewers and followers worldwide. We deeply appreciate auction companies that have donated to our scholarship fund. 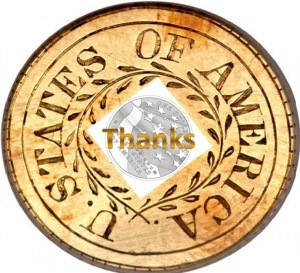 If you feel we have made an impact on your business or have advanced numismatics and the hobby, we ask that you make a contribution by clicking here. You can also order any of our books on coin design and online auctioneering. Both are available on Amazon Kindle. 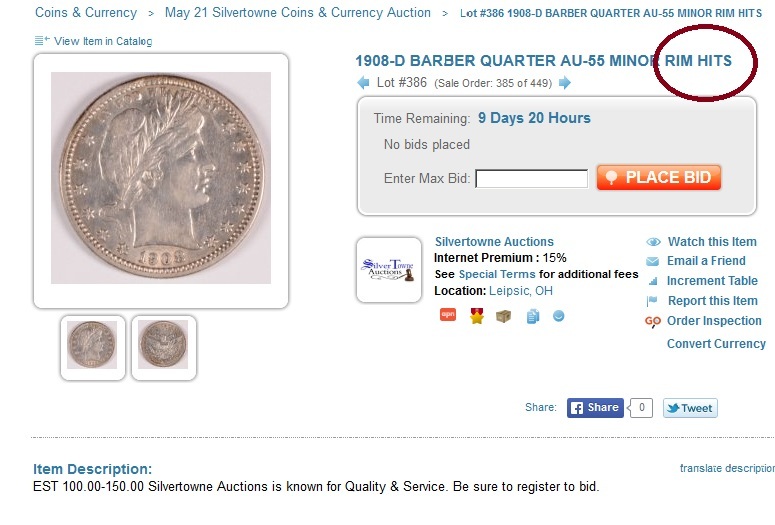 Online Coin Auctioneering is intended for eBayers who sell coins and for estate auctioneers considering or already selling on a portal such as AuctionZip, iCollector or Proxibid. Basic Coin Design analyzes every coin minted by the US Government, in terms of design characteristics and appeal. If you enjoy our posts about the hobby, remember you can still access content on Coin Update News (Coingrader Capsule) and Coin World (Home Hobbyist). Finally, we appreciate Proxibid, especially is excellent customer service division–best in the online business–and hope we have helped enhance its quality control and brand of trust. Thank you and happy bidding and auctioneering! Look closely at the Peace dollar above. You’ll see it is harshly cleaned. How much would you pay over silver melt? $10? $30? How about $60,000? 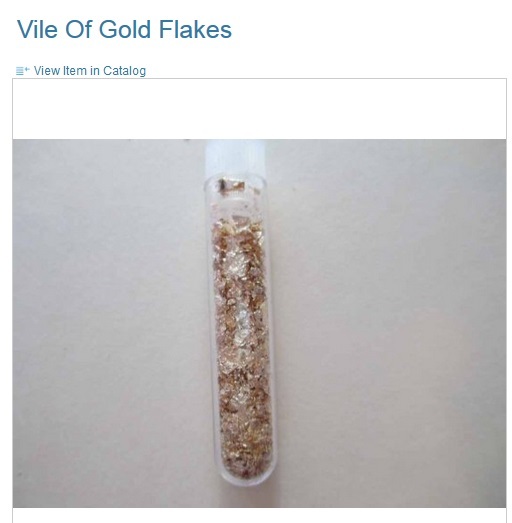 That’s what this Proxibid auction house suggests in its lot description. 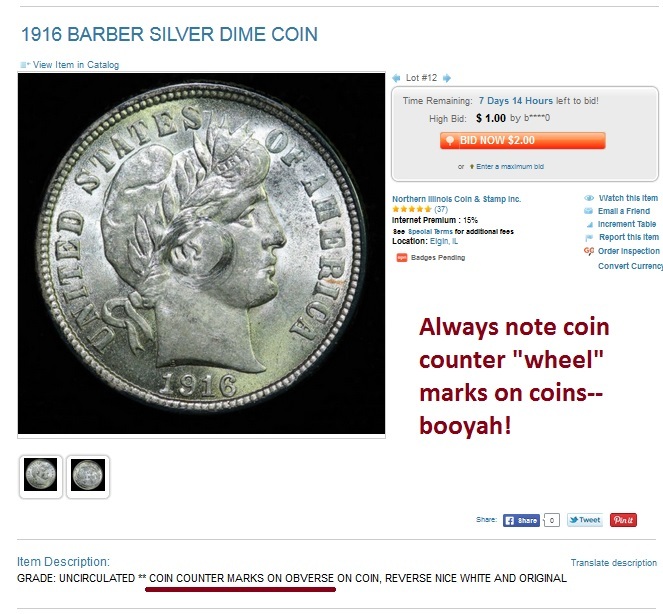 Auctioneers who sell coins need to know how to cite value. PCGS values are high because its standards are among the most rigorous in the industry. 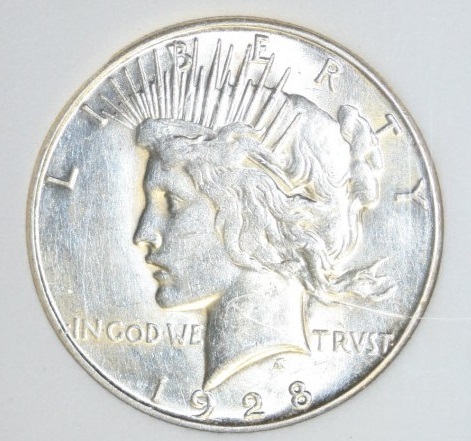 NGC, also considered a top-tier company with high standards, commands premiums for its coins. 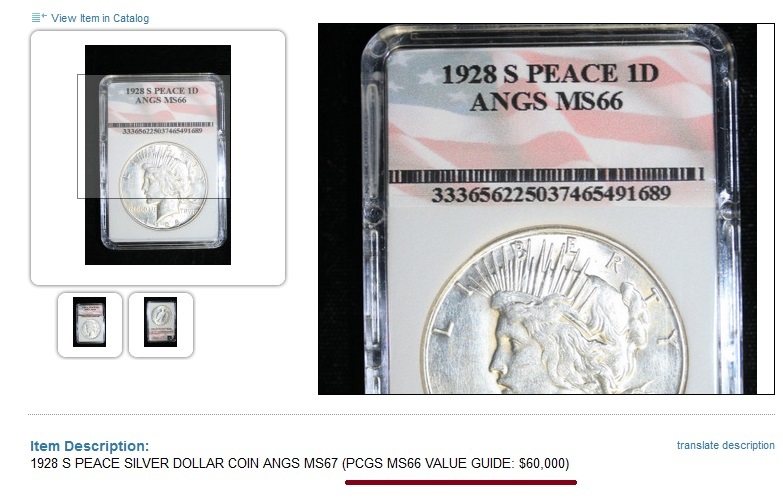 However, its standards differ from those of PCGS, so it is also inappropriate to cite PCGS values for NGC coins. Treat all other slabs, even PCI and Numistrust and so-called third-tier companies, with caution before stating any values. The first hype is the slab itself, boasting that a harshly cleaned 1928-S is MS66. 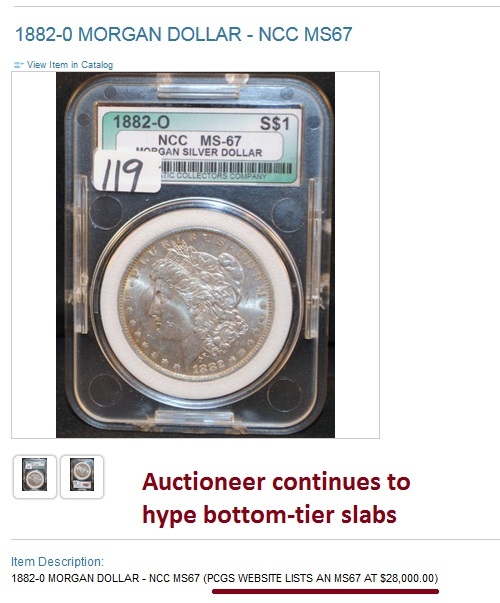 The second hype is the description that cites PCGS values at $60,000. The third hype is Proxibid’s lack of standards when it comes to values cited in lot descriptions. Top Houses Get Better; Others Dropped–Views at All-Time High! 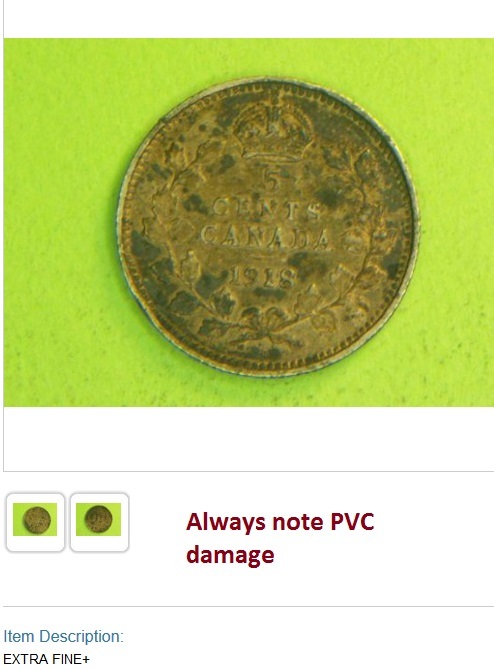 Increasingly we’re seeing fewer new coin auctions on Proxibid worth bidding on, relying more on our top favorites that maintain standards in photography, consignments and customer service. Few can beat Brad Lisembee at Capitol Coin Auctions and Dave and Cheryl Weaver at Weaver Signature Coin and Currency Auction. For more than a few years we had been listing as favorite houses about a dozen that have maintained 2012 standards … but have failed to improve to 2014 standards requiring sharp photography, reliable lot descriptions and cherry consignments. We read notices on their sites stating, “Tell us how we can be better,” and then see the same blurry photographs or the same inferior lots. A few houses have been dropped because their consignments have not warranted a lot of interest–consistently, for the past several months. As soon as they get better coins, they’ll likely be back in our rankings. Technically, we have dropped all houses that failed to earn a 24.5 out of 25. 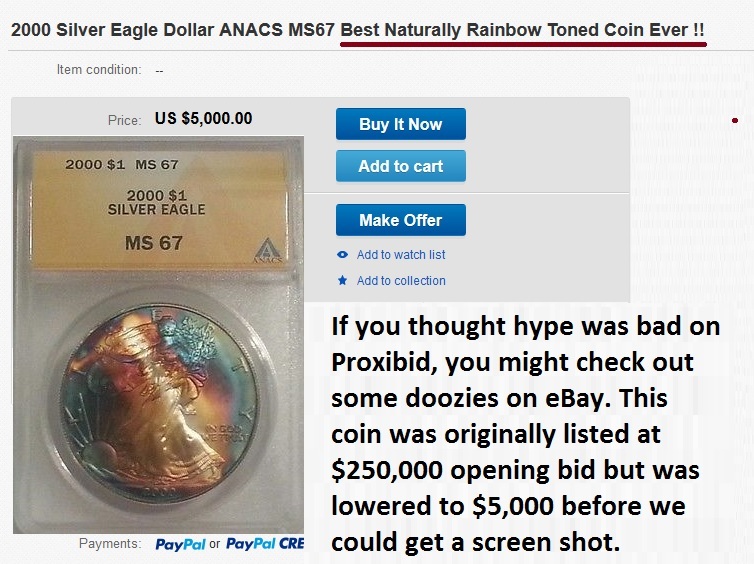 Despite that news, coin auctions on Proxibid have been exciting. Fox Valley, Capitol Coin, Weaver, Krueger and Krueger, SilverTowne, Leonard, Star Coin, Jewelry Exchange, Back to the Past, Meares, et. al.–who could ask for a better selection! 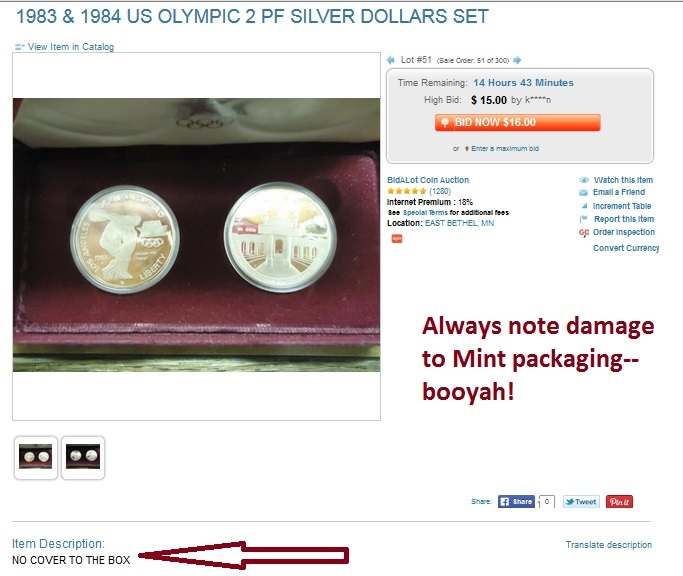 Even Kaufman Auction is getting coins shipped in a timely manner and posting photos within a week of the event. 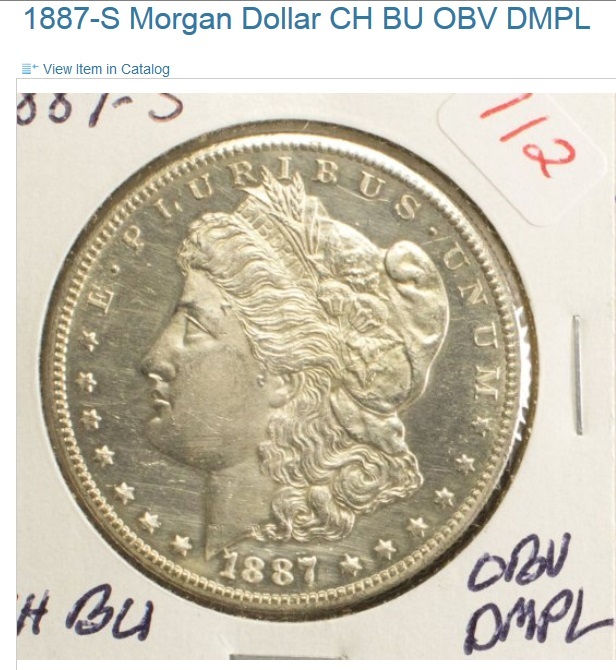 McKee Coins is improving, as are Auctions By Wallace and A New Day Auctions. We continue to provide best practices and numismatic knowledge to our viewers for free. Please consider making a donation. 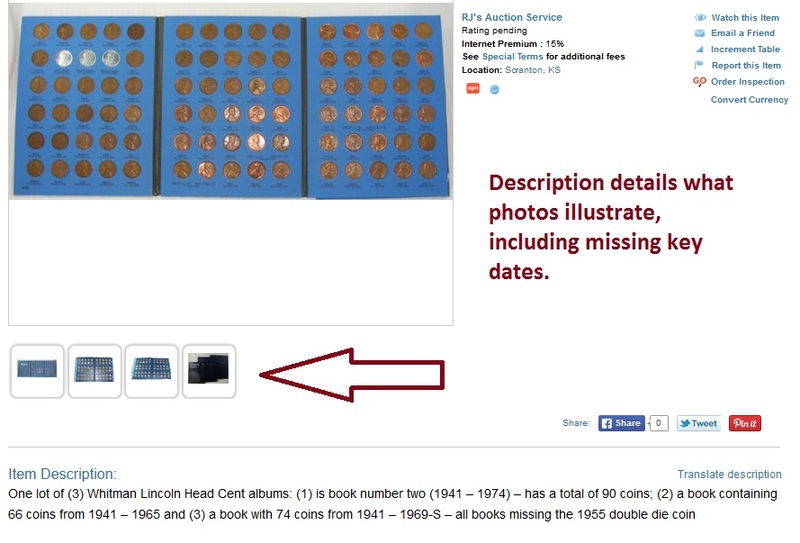 We post daily during the week, which takes time and effort, and do this for educational purposes, informing auctioneers about best practices and viewers about numismatics. With our sponsorships, we fund media ethics scholarships for Iowa State University students. Fortunately, we have several of our top houses donating funds to our scholarship account. You can also buy our new work, Online Coin Auctioneering or Basic Coin Design on Kindle. We are extremely grateful. Won’t you consider making a tax-deductible donation to the Iowa State Foundation so that we can continue publishing? Thank you for your consideration! Best Naturally Toned Coin on Hype-Bay? Numismatic exaggeration reached new heights this week on eBay when this attractive but all-too-common toned coin was originally listed at a quarter million dollars. The seller later reduced the price to $5,000 before we could get a screenshot. But we still have the evidence as we emailed the link for later follow-up. See it below. A Truly Spectacular Naturally Toned 2000 Silver Eagle, Graded, Certified, and Encapsulated Mint State 67! This Coin with it’s Eye Popping Color as Slabbed is EXACTLY the way I submitted it for Grading Earlier in Sept. 2014! 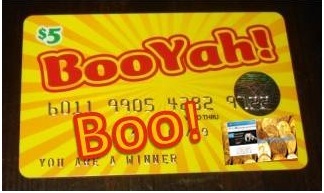 This Coin is “Fall Out of Your Chair Gorgeous”!! The Rich Color Combinations on the Obverse and Reverse are a True Work of Art–Looks a lot like a Kaleidoscope of Colors!! 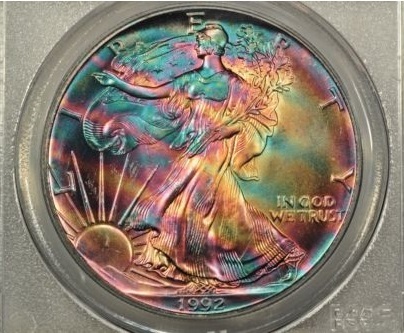 The BLAZING Colors on this Coin Leave me SPEECHLESS!! 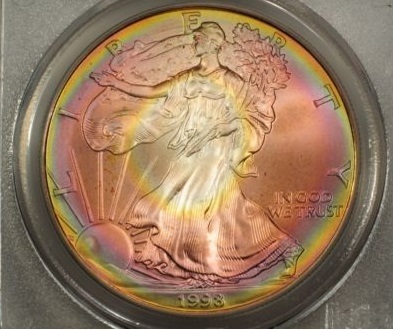 I have NEVER Seen any other Coin in any denomination, U.S. or Foreign with Such BREATHTAKING Rainbow Tones! Notice the Lighter Hues Coming Down and Across the Obverse of the Coin. This looks like Rays of Sunlight Coming Down from The Clouds—AMAZING!! Buy it Now Or Make Your Best Offer! This is a Once in a Lifetime Coin for the Fortunate Winner!! They’re not for sale, by the way. But, well, we’ll reconsider if anyone is offering $250,000 … or even $5,000!